The awards season is always an exciting time of the year in the entertainment industry. A number of organizations hold grand events to recognize the best output in the industry. Many viewers will be breaking out the popcorn for the granddaddy of award shows on the 24th, cheering for their favorite movie, actors and directors. One movie in particular: Zero Dark Thirty was highlighted in a recent article describing how their production team utilized a mobile digital lab to offload and archive approximately 276 hours of images used during the course of the shoot. What did they use to archive that valuable content? 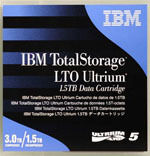 LTO tape with the Linear Tape File System (LTFS). LTO tape and LTFS have been walking the red carpet in the media and entertainment industry since the introduction of LTO Generation-5 technology. There are increasingly more and more production companies integrating LTO tape with LTFS into their workflows to address the ever-growing amount of digital content being produced. Why is this occurring? It’s the need to protect and retain the big data content. New digital technologies – 3D, 4K, etc. – require exponentially more data than the technologies that came prior. For instance, each frame of a 4k “film” is 50 MB – that translates to 70.3 GB per minute and 4.1 TB per hour! For a production company shooting an average of four hours of footage per day, that can add up. Keeping hundreds of hours of such content online on disk could quickly become cost prohibitive. 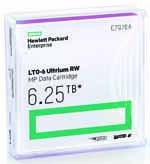 The new LTO generation-6 tape can store 2.5TB uncompressed for outstanding long term retention at about 5 cents cartridge cost per gigabyte uncompressed* and with LTFS using tape is easier than ever before. 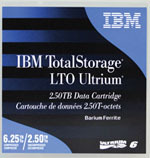 The size and cost of LTO tapes combined with the ease-of-use provided by LTFS create a very effective way to transport these critical files back and forth during production. Large amounts of data can be sent more quickly, economically and securely than network-based methods. This is especially compelling for digital productions where terabytes of data are being captured daily. 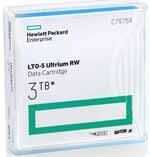 For example, you can put 20 LTO-6 cartridges in a box (that’s 50TB uncompressed) and ship them from New York to Los Angeles in about 15 hours overnight. That works out to an effective transfer rate of over 4TB/hr or nearly 9 gigabits per second. That is low cost - high bandwidth in a box!